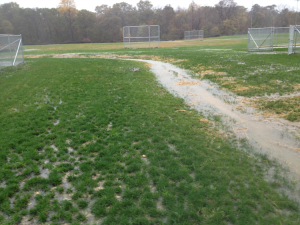 Athletic fields that don’t drain well need laser grading - Alpine Services, Inc. 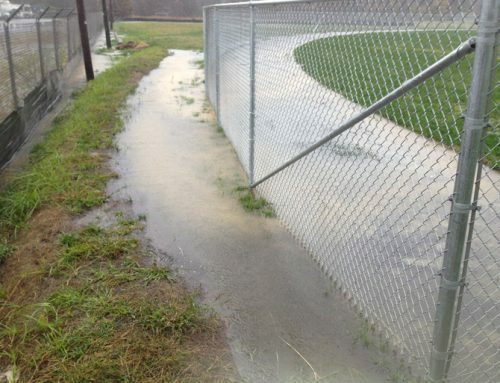 Surface conditions often dictate an athletic field’s playability. Depressions, caused by bad design or wear, hold water which consequently limits play. This is especially true in spring when snowmelt and abundant rain exacerbate drainage problems. Fields must be precisely graded so that water will run away from the play area and continue past the benches and sidelines. Without proper grading it is all but impossible to assure drainage. The obvious solution is laser grading. Keep in mind that water runs down even the slightest slope. Without laser guidance, it is all but impossible for workers to adjust the slope just enough to drain water without overdoing it and making the field needlessly sloped. You need laser grading, but not all lasers are created equal. Most laser sources lose 1/8” accuracy per 100 feet of distance from the laser source. Therefore, the grading will be more accurate near the laser than farther away from it. If the source is placed on a side or end of a field, the far side or end cannot be graded as accurately. Based on this, the laser source should be placed in the center of a field, but that can prove to be problematic because it can get in the way of the work. Fortunately, there are laser sources that lose only 8 arc seconds per 3,000 feet. With that degree of accuracy, the location of the source is not important for grading an athletic field. The quality of the receiving readers is also important; some readers can give much more accurate results than standard, “off-the-shelf” units. As you may have already concluded, when you hire a company to do laser grading, you should specify the accuracy of the equipment being used. In the same quest of achieving better grading results, you should specify a meaningful grade tolerance. Laser grading contracts often specify tolerances such as “+/- ¼” over 10 feet.” Such specifications are far too coarse and are therefore essentially meaningless for athletic field renovations. Under those tolerances, a typical athletic field could be 4-6” off of the intended plane. To prevent this problem, contracts should specify that the tolerance is “+/- ¼” over the plane of the field.” This will assure that no point across the full width and full length of the field will be more than ¼” above or below the specified plane. Modern equipment, by the way, can grade to +/- 1/8” over the surface of an athletic field.